Are you trained on our 30 watt Epilogue Zing already? 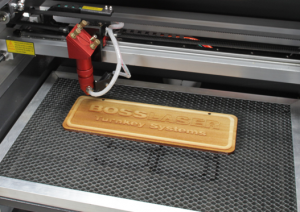 It may be time to step it up to the 150 watt Boss LS-3655 laser cutter. Featuring a significantly larger bed and the improved capability of cutting up to ½” thick material in a single pass the Boss laser is a cutter’s dream. In this badge workshop attendees will learn the basics of properly configuring the laser cutter, choosing the correct materials for the tool, and general safety guidelines when using a laser. This class does not include file preparation or design elements necessary prior to using the laser cutter. MAKE does offer a course specific to file creation and preparation called File Preparation for Laser Cutting. Jasmine Quinsier is a passionate maker professionally and in her free time. She’s defining and breaking the boundaries at the intersection between the drawn image and its digital counterpart.